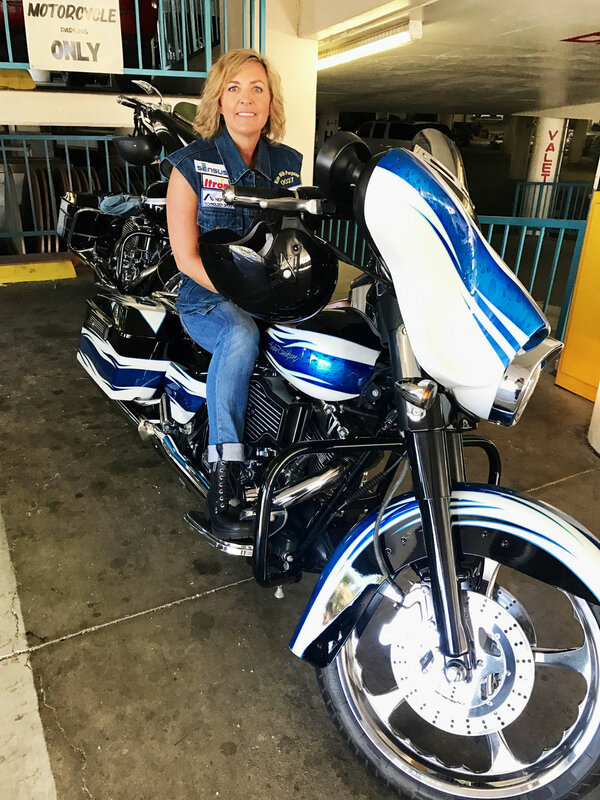 V&A's President, Debra L. Kaye, PE joined other motorcycle enthusiasts, in the Water Buffalo's Ride with Purpose. 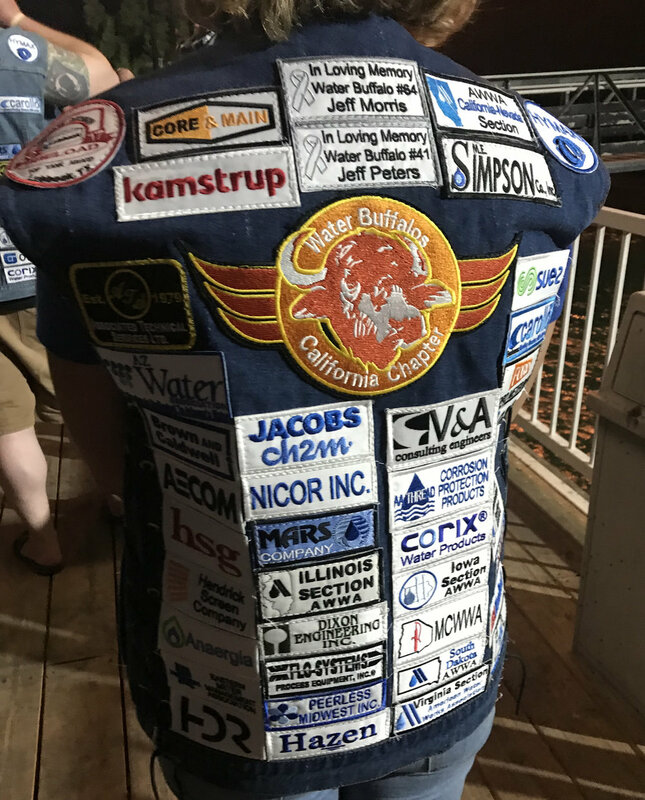 All of this fun is in the spirit of raising money and awareness for non-profit organizations that provide for safe drinking water, sanitation services and environmental stewardship to communities in need. V&A was also a sponsor contributing to the overall $130,000 raised for Water for People and AWWA's Community Engineering Corp.
WATER FOR PEOPLE is an international non-profit working across 9 countries to bring safe water and sanitation to 4 million people. It exists to develop high quality drinking water and sanitation services, accessible to all, and sustained by strong communities, businesses, and governments. Check out our V&A patch! Join us at the premier conference for buried utility engineering, underground infrastructure management, and surveying practice. Expand your knowledge base to enhance the success of your projects at this leading industry event for practitioners covering the most current state-of-the-art engineering technologies for pipeline and utilities infrastructure. Take advantage of the international setting to network with your peers, potential clients and project team leads. Earn up to 26 PDHs via thought-provoking interdisciplinary education, inspiring and enlightening keynote speakers, tours, and short courses on topics relevant to pipeline and trenchless technologies in water, wastewater, storm drainage, gas and oil pipeline systems. Connect with exhibitors show-casing over one hundred top products and services in pipelines technologies. Explore the Canadian heritage in Toronto and the larger surrounding area including the breathtaking Niagara Falls, and neighboring cities of Mississauga and Brampton. Pipelines 2018 is part of the new ASCE Utility Engineering & Surveying Institute (UESI). The conference will continue to provide a forum for pipeline engineers and practitioners from all around the world to share their experiences in meeting the challenges of today's pipeline infrastructure. This premier industry event has become the conference of choice for utility and pipeline owners, design and consulting engineers, contractors, manufacturers, suppliers, students, educators, researchers, and pipeline professionals. The conference will also include surveying as it relates to pipeline and utility projects. The Pipelines 2018 Conference will provide a dynamic and inspiring venue for participants to share and gain valuable knowledge related to planning, designing, constructing, renewing, operating, managing and maintaining the lifeline assets. Condition assessment evaluations of water and wastewater facilities often require confined space entries to get the required data. V&A has conducted over 20,000 entries over the last 10 years. Condition assessment methods include visual assessment, concrete sounding, concrete penetration tests, concrete surface pH, surface penetrating radar, coating evaluation, concrete core samples, and metal ultrasonic measurements as appropriate. The objective of the condition assessment is to provide physical and analytical condition data to support rehabilitation, expansion and upgrade design of the facilities and the determination of remaining useful life. Condition assessment methods will include visual assessment, concrete sounding, concrete penetration tests, concrete surface pH, surface penetrating radar, coating evaluation, concrete core samples, and metal ultrasonic measurements as appropriate. V&A is conducting annual corrosion control surveys over a three-year period for Houston’s METRO light rail transit (LRT) system. The METRO LRT system is continuing to expand, with new lines and extensions opening in recent years. 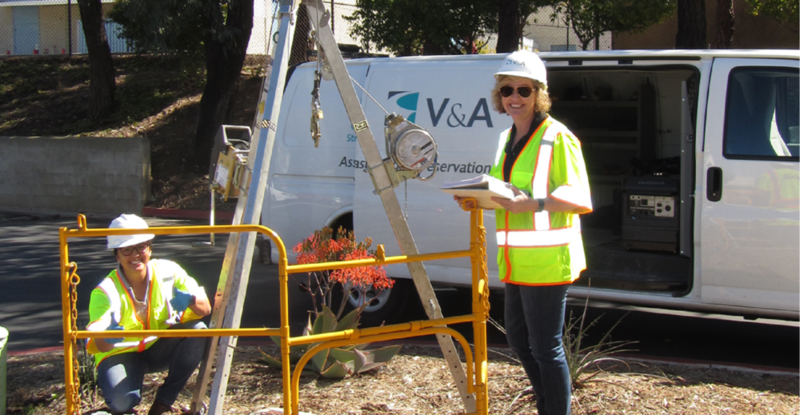 In addition to the ongoing measurements of stray current on the existing system, V&A has performed corrosion control testing on the new lines and line segments during construction and during the pre- and post-startup phases. This testing includes track-to-earth resistance testing for both electrically isolated and electrically interconnected track segments, holiday testing of rail boot insulators, and baseline measurements of pipe-to-soil potentials on adjacent utility pipelines. OAKLAND, CA, June 8, 2017. Company founder, José Villalobos, PE relinquishes the post after 38 years at the helm. José will continue with the firm in a more focused role as Chief Marketing Officer. Kaye is a licensed professional civil engineer and brings 30 years of diverse experience from the water and wastewater industries—as water treatment plant operator, design and planning engineer, water systems operations and maintenance manager, general manager, water and sewer infrastructure professional consultant, client services manager, and most recently as Vice President of NeoTech Aqua Solutions. In 2015, Kaye joined V&A as Senior Project Manager and was promptly moved into the role of Southwest Regional Manager. Since Debra began managing the San Diego office, it has doubled in staff size and become a healthy contributor to V&A’s bottom line. Kaye graduated from the University of Reno with a BS in Civil Engineering and is licensed in California and Nevada. Kaye also maintains her Water Treatment Plant Operator and Water Distribution Operator certifications. Debra has been very active with the American Water Works Association (AWWA) in many roles including a seat on the Board of Directors, as Vice President, as well as the Young Professionals and Sustainability Committees. She has also received several awards from the CA-NV Section of AWWA— Chair’s Award, George A. Elliott Memorial Award, and the Warren Fuller Award. Debra was also featured in the American Society of Civil Engineers (ASCE) book “Changing Our World: True Stories of Women Engineers” published in February 2006.